If you're familiar with my blog, you know that I have a soft spot for stews. I grew up eating them almost weekly. Although most of the times in Romania people will eat meat-based stews it is not unheard of to make stews out of vegetables. Since I'm still sticking to my plan of eating clean in my attempt to get rid of a few extra pounds I decided to try my hand at a vegan dish. The good news for those who love eggplant as much as I do, is that they are in season. I'm signed up for a bi-weekly delivery of fresh local vegetables from Farmhouse Delivery and the latest vegetable bushel contained these cute baby eggplants that I had no clue what to do with. They were too small for my eggplant lasagna or for my mom's eggplant spread, but too big to pickle them whole. So I looked through my notes on my phone and I found one that said "Make Caponata next time you come across fresh and cheap eggplants". I can't remember exactly where I got the idea from, but it must've been from one of the cooking shows that I've been watching lately. Caponata is a fragrant Mediterranean eggplant dish that comes from Southern Italy- the island of Sicily to be more specific. It is a versatile summertime classic in Italy. 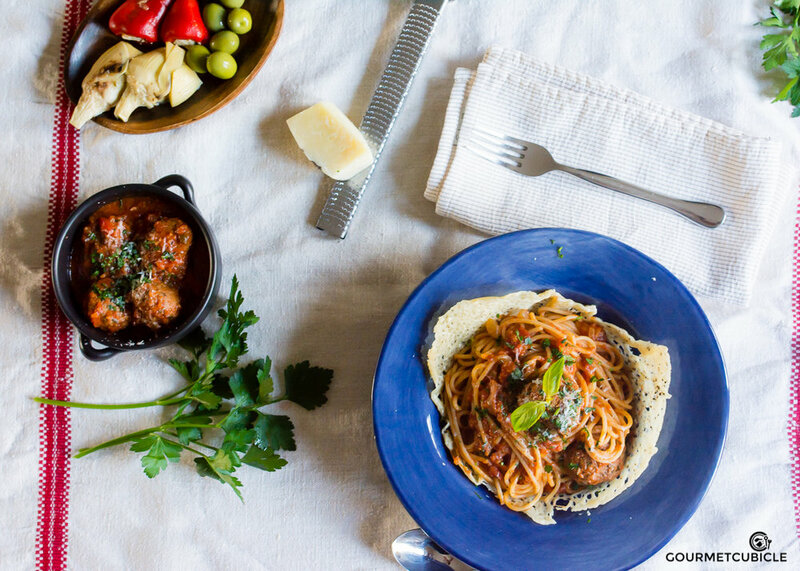 While eggplant, celery, onions, olives, capers, tomatoes, olive oil and vinegar are main ingredients, some Sicilians will add anchovies, artichokes, peppers, potatoes, mushrooms and even chocolate to it. Depending on the region, city or household, opinions are split regarding what goes into the perfect caponata. 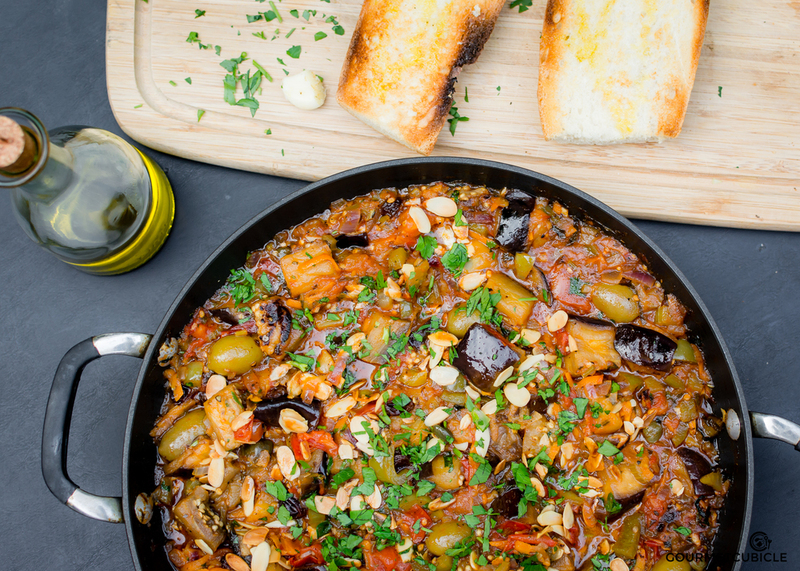 For me the perfect caponata is one that includes the main ingredients plus a few aromatic herbs for extra flavor. Caponata can be served warm as a side dish with grilled fish and meats or at room temperature as an antipasto. I found that a nice balance between the sweetness of the vegetables and raisins and the sourness of the vinegar is achieved at room temperature. I went as far as adding a couple of spoons in my scrambled eggs and let me tell you that it was rather delicious. Buon appetito! Salt the eggplant chunks generously. Use about one tablespoon kosher salt and toss well to make sure all chunks are evenly coated. Let them sit in a colander for about 20 minutes. This will help get rid of the bitterness of the eggplant and will also make it less soggy and more tender when cooked. While the eggplant is resting prepare the tomato sauce. Heat two tablespoons olive oil in a medium saucepan over medium-high heat. When the oil slides easily across the skillet, add shallots, scallions and carrots and sauté for 5 minutes. Toss in garlic and cook for another 2-3 minutes. Add tomatoes and oregano and bring to a boil. When it boils, reduce the heat to low-medium, cover with a lid and let it simmer for 10-15 minutes, stirring occasionally. When done, taste and season with salt and pepper and give it another stir. Set aside. Rinse eggplant under running water to wash off the excess salt. Drain eggplant and place chunks on a tray lined with paper towels. Pat them dry. This is very important because you'll fry them next and you don't want to oil to splatter everywhere. Once dry, sprinkle coriander and dry oregano coating the eggplant evenly. In a large non stick pan, heat two tablespoons olive oil over medium-high heat. Work in batches if you think that the eggplant won't comfortably fit in the skillet. When the oil is shimmering, add eggplant and toss to coat evenly with oil. When the eggplant chunks are golden brown on each side, about 5-7 minutes, transfer to a paper towel lined tray or wire rack. In a large and deep stainless steel skillet heat 3 tablespoons olive oil over medium-high heat. When the oil is hot (it easily slides across the pan), add onions, peppers and parsley stems, stir and cook until onions are translucent, about 7 minutes. Toss in garlic next, stir and cook for another 2 minutes, then add raisins, eggplant, celery, olives and capers. Toss and cook for another 5 minutes then pour in vinegar and sugar. When the vinegar evaporates, about 5 minute, add tomato sauce. Lower the heat to medium, cover and cook for 5 more minutes. When done remove from the heat. Taste and season with salt and pepper. Sprinkle with parsley leaves and toasted almonds. To toast the almonds, heat a small skillet over high heat. When the skillet is hot, add almonds, toast and stir for 2-3 minutes until they become golden brown. Cut a baguette in half lengthwise (or slice of bread), toast it and then rub one side with garlic. Top toast with caponata. You can serve it cold or warm, whichever you prefer. When frying the eggplant, don't overload the pan, as it will reduce the heat too drastically and the eggplant chunks will absorb all the oil making them soggy and greasy. Instead work in batches if you have to. Split the amount of oil into the number of batches that you'll cook. Don't use a cast iron pan as tomatoes and vinegar will be used in this recipe. The acidic reaction between the metal (cast iron) and acid (vinegar and tomatoes) will not only alter the color of the tomatoes, but also may damage your pan if it's not seasoned properly. When toasting the almonds, make sure you toss and stir often as almond shavings burn fast. When done, remove the skillet from the heat and transfer the almonds immediately to a plate as they'll keep toasting even after you removed the skillet from the heat. Store caponata in the refrigerator in a sealed container. It will keep well for over a week.